On October 5 I participated in IntranetNow, and a wonderful conference it was! Baxter Willis of WM Reply shared a great Yammer use case from one of his clients, drinks business Diageo. Apparently they have an archive of all bottle types, advertising materials, recipes etc. Nobody was really aware of that department, until recently. They are digitizing their content and the archivist posts something interesting on Yammer every day, e.g. “Did you know that Pimm’s has been associated with Wimbledon from the 1930’s?” accompanying a picture of a nice old newspaper ad proving her point. This lady is now the toast of the company and her Yammer group is very popular. I like this because it is another easy way to share knowledge, which would otherwise be hidden in the archive. Posting it on Yammer costs nothing more than 5 or 10 mins a day. It helps the Marketing and Social Media people in their current work by giving them new insights to the company and its history. The new Smirnoff label is now based on earlier labels throughout time, and this is also caused by this work! Emma Morrison and Usman Hasan of Hyde discussed the their intranet redesign, based on feedback sessions with their employees. What I liked about this is that they used a simple but effective approach of lunch sessions, and shared their learnings. The “let them rant” or “whine and dine” idea resonated with me, as I have also found that sometimes people just want to vent, sometimes not about the intranet itself, but about related things. In my situation I have heard from several annoyed people who had been handed over a team site due to reorganizations – either because they had a new role and the team site came with it, or because the previous owner had moved on. Someone else’s team site can be quite hard to handle as the setup and especially the permissions are not always documented or intuitive. Janet White shared her approach to improve an intranet with very simple means and no budget. Anyone who can get good results with creativity and elbow grease, rather than money, is my hero! Using simple tools like card sorting, tree testing and talking to users helped her to improve the navigation of the intranet (better labels and better structure) and some of the content. I have linked to the Slideshare versions of the presentations as I expect the information on the IntranetNow website will be replaced next year. Dazed and Confused – by SharePoint online? We are moving from an old on-premise SharePoint intranet to one on SharePoint/Office365. I have been using SharePoint Online from 2011 so I have become quite used to the interface and its regular changes. But I was very curious what my end-user colleagues would think of the new SharePoint and I recently had the opportunity to train a number of them in the new environment. Our goal for this training was to get an idea of how people would react to the new platform, and which elements would be clear immediately and which would need more help and instruction. All participants (except one) had experience with managing SharePoint sites. They also knew this was an experimental training so they were encouraged to be outspoken about their findings and suggestions. Each got their own test site in our test tenant, which is on first release. When you log on to Office365 for the first time, you get a lot of pop-ups about Office365. While that is helpful for new users, for this purpose it was annoying because people were less interested in Office365 than in SharePoint. Clicking around opens up a ton of new screens, which was not universally liked. This was a bit confusing, because people have never had that, and the page was mostly empty. The test sites did not show in everyone’s page, despite them having personal access. I do not know if that is a search indexing thing or that you must have visited the site before it is shown in your “recent” sites. As soon as everyone was on their site’s homepage, I told them to “Follow” it to be able to revisit it quickly, and everyone got it. I took them to Site Contents, and then I found that some of my trainees had the old Site Contents with tiles, and some of them had the new experience . That was a bit confusing, but it was a good illustration of the ongoing changes that everyone can expect. Document Libraries were already in the New Experience, and I was a bit worried if people would be able to overcome the gap in look-and-feel between our old SharePoint and the new one. It was a pleasant surprise to notice that, with just limited instructions, people took to it straight away. Everyone saw the benefits of the Pin To Top functionality, and I saw two people nudge each other happily when they learned about the library and document information pane, that also tells you who has deleted a document. No more guessing or blaming SharePoint or IT! The Document Library with the information pane. Just click the i on the top right of the library. You can see which documents have been created, edited, deleted, restored, by whom and when. Great! Unfortunately the Lists were still on the “old experience” with the tabs and the ribbon. While I have always loved the ribbon in The Office Suite, I have never taken to it in SharePoint, and I am more than happy to see it go. My trainees did not use Lists much (an opportunity for later!) but they got it quickly enough. Deleting and Restoring content is a topic high on my agenda. We often get panicky calls from people who have “lost documents” and have never heard about the Recycle Bin. I added a few exercises with deleting and restoring documents and list items, told them what to do themselves first, and then how to get help. It all went smoothly once people knew how long things will be stored, what goes via the Recycle Bin and what does not, and what they can do themselves and when it is time to contact the site collection admin. The Quick Links (team site) and Navigation (Publishing site) caused some confusion since it is a mixture pf settings and edits, and moving the menu items around resulted in unwanted indentation. It is also different from the custom-built navigation many people have used, so this will definitely need some more instructions. Editing a site’s homepage turned out to be quite easy for the trainees. Everyone in the audience had experience with managing Publishing sites. They sighed happily when I showed them they can now insert images from their PC in the Content zone without having to upload them to SharePoint first. Editing the (basic) team site homepage was even easier. Inserting a picture from PC appears to be so much easier! The image renditions show you how a picture will be displayed in different formats. Promoted Links have been designated as an important tool for nice looking links to other content in formal sites. Oops, this was a bit hard. Of course this is a new functionality so people did not know it beforehand. But I also think that the default configuration can be improved. That will be another blog. Promoted Links with 3 different opening options. All in all, my trainees did quite well. But then they were experienced and motivated. I think they benefited from my little bit of hand-holding and assuring them that most was still there, just in another place or with another name. The only person who was a bit lost was the person with no earlier SharePoint experience. Have you introduced Office365 recently and if so, what have been the largest hurdles for your audience? Dazed and Confused? I do not think so. In my earlier posts, I have helped you prepare and start testing you SharePoint solution. In this final episode we will discuss giving feedback and finalization/implementation. Step 8. Give feedback to the person who is configuring the site. First discuss your notes from steps 5, 6 and 7. Then, also think about the views in your list or library. Now that you have created some items you will be able to see how your views pan out. Views are a great help in managing your process, but they are often not used to the max. Are those columns shown that you need most, are they in a logical order? Can we remove columns for a better overview? Do we need to add some to make the data more meaningful? Are the items sorted in the desired order (e.g. newest on top, highest priority on top, nearest due date on top)? Are the views grouped correctly? Would grouping help you with the overview, or does the grouping hamper your understanding of the data? Do you miss any views? Think about how you will manage this process, and what information you will need. An overview of different issue types? The number of open issues? The amount of money associated with these issues? Homepage View for CRM: overview of number of open incidents and amount of money involved. Some items of your feedback will be easy to fix, some things will need a workaround, and some things will not be possible at all. It may take some discussion for both parties to understand requirements and possibilities. In the case of CRM, we had a lot of debate on the “Assigned to” field. This was used in every step and positioned at the bottom of the first step. If you had a role further in the process, you had to scroll up, and sometimes quite some distance! 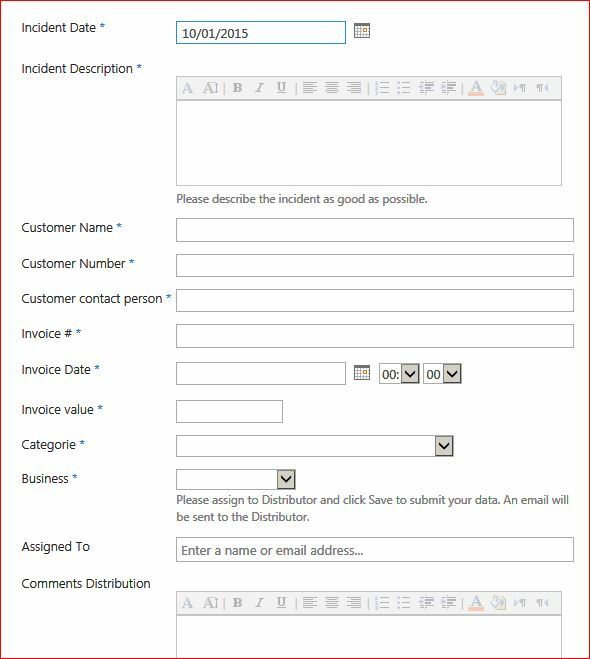 If you did not do it correctly, you could also accidentally change existing data, especially drop down columns. This could not be fixed, but we gave instructions about HOW to scroll up – “point your mouse somewhere in the white space and scroll up to avoid changing the existing data”. Step 9. Repeat with the improved solution. When your configuration person hands over the optimized list, repeat steps 5, 6, 7, 8 until you are satisfied. It may take only one small change (then your testing programme can be focused on that one item) or a massive change that will need a complete retest. (Luckily this has not happened too often). Step 10. Test with others. When you have tested all scenarios and are convinced that this is what you need to manage your process, test it with your intended users. Repeat steps 5 to 9 in the correct roles until everyone understands the process and is ready to use it. You may need to create some training materials to help new people learn fast and as reference. Yes, this can be a lot of work. But as mentioned before: Testing your solution thoroughly, and not just “looking at it”, will speed up the implementation and avoid changes later. This text may also lend itself to being made into a one-pager of sorts. That will be another fun project! Please feel free to use this for your own processes, and let me know how it worked out! Any additions or suggestions are welcome! 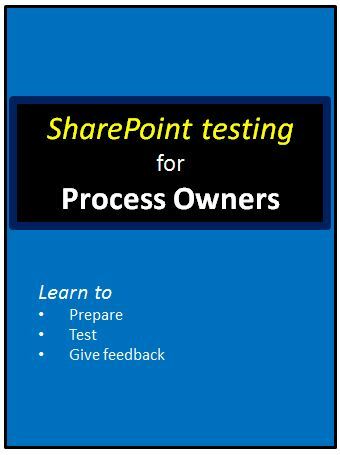 SharePoint testing for Process Owners – and now for real! In my last post I helped you make preparations for testing your solution properly. Just having a brief glance and thinking “looks good” is not enough. You really have to “live” the process to see if I have translated your requirements correctly. Step 5. Run the process as it should run. Are the column names, the choice values and a description/instruction correct and easy to understand for your audience? Are the correct columns mandatory – or not? Do you receive a notification from an Alert or workflow? If you use workflow, are subject line and body text of the email meaningful, and is the attached link accessible? Make a note of all things that are incorrect, not meaningful, that could be improved or that you would like to add/remove. Now, switch to a different role and do the next step in the process. Start from the notification or the workflow or wherever you need to start from. For Software Cost Reductions: You will now look at the input as the IT Manager. The second and last step is to look at the input as the IT manager. 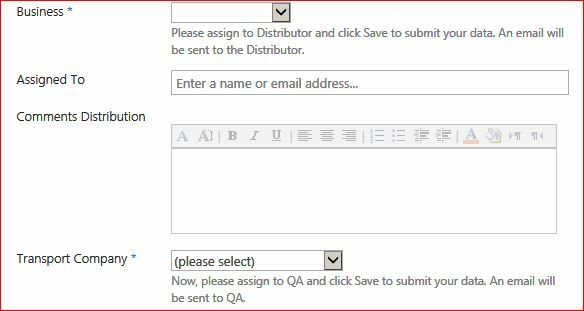 For CRM: You will now act as the Distribution Manager, add information and assign it to Quality Assurance. CRM Step 2: Distribution department receives entry from Customer Services, then hands it over to Quality Assurance. Repeat for the other steps (where appropriate) and make notes of everything you want to discuss. Step 6. Repeat with different scenarios. Run the different scenarios you have created in step 2 and see if it still works as planned. E.g. use some different values and/or reject an item if you first approved one. Make notes. Step 7. Hack the process. If you have found a showstopper in steps 5 or 6 (e.g. an error message) skip step 7. But if it all still works as planned, make a deliberate mistake or two. Think about mistakes that you or your colleagues may make. Enter a value that is not allowed. Forget to fill a mandatory field. What happens? Is it clear that the process is not going well? Do you get enough information about the problem and how to solve it? Make notes. Up next: Feedback and finalization. In the next post, we will discuss giving feedback, finalizing and implementation. In the meantime, if you have suggestions or additions, please let me know! When I create a solution, I always casually ask the process owner to “test it”. I have found that I often get change requests when the system has been running for some time. This has made me realize that process owners may not always know HOW to test properly. Although SharePoint is pretty flexible, it can be hard to make changes afterwards without compromising content and setup. (Ever tried replacing a Choice column by a Lookup column mid-process?) I would like to prevent that. How should end users test? I have looked for good websites or “Software testing for dummies” but I have been unable to find something sufficiently practical for this purpose. Remember, my users excel in other things than IT and testing. They do not need a lot of theory. They just want to get it over with as soon as possible. So I thought I’d write down an average test scenario “for the business”, based on the solutions I usually create. Please let me know if you have additional resources and ideas. My solutions usually consists of a list and a few actions. Someone enters values in the list, clicks OK and then an Alert (or workflow email) is being sent, and the recipient does something. There may be several cycles. Data Entry > Save > Notification > Recipient takes action > Recipient enters or changes data > Save > Repeat from “ Notification” if needed. * Software Cost Reductions. This is a very simple one-step process: Data entry > Save > Notification > Recipient takes action. Simple process: survey with 2 questions. * CRM in a TeamSite. This is a multi-step process with different roles, where there are several cycles of Notification > Recipient takes Action > Recipient enters or changes data > Save. Why do I not do this for my users? Oh I do. Before I ask the process owner to test I have made sure that it works at least from a functionality standpoint. But I know too much about SharePoint, so I generally know what to expect and where to look, even if the solution is not very intuitive. And I do not know the process as well as my process owner does, and I do not know which mistakes their colleagues may make. Only the process owner can give me that information. Well, that depends. Some processes are very simple to test and will take 15 minutes. The CRM example on the other hand was a complicated process, and it took several optimization rounds and several weeks to be OK and clear for everyone. The business case was enormous so all effort was worth it! And implementation went very smoothly because it was tested rigorously by several people. How to test your SharePoint solution. – Have we understood and captured your needs correctly? – Will this help you with a better and smoother process? – Is it simple enough to be adopted quickly by your team? – Do you feel confident with the solution so you can introduce it to your users and own the solution? Step 1. Check the process. Have the process description or flowchart ready. If you do not have a flowchart, you may want to write down the different steps schematically, from first entry to finalization. Note the different roles that you can have. Software Cost Reductions: You will be an end user, and the local IT manager. CRM: You will be Customer Services, the Distribution Department, the Quaity Department, the Transport organization (external), the Business Manager and Treasury. Step 2. Sketch some common scenarios. What is the ideal process? What are the different routes an item can take, e.g. approval, rejection, delegation, wait for more info, etc. Are there any mistakes that are often made? Be prepared to test all those scenarios. If this process depends on Alerts, make sure you have the proper Alert(s) set up even if you will not be the recipient of the Alerts in the real situation. You will need to check if all works OK first before handing this process over to others. Plan time in your agenda to do this. You are expected to run the process several times (2-5) in its entirety by yourself. Please allow time to make notes of your findings and give feedback. CRM: could be a day. OK, these were the preparations. Next time, we will start to test properly!